Rudge gets the snip in Governors Harbour and other doggy tales ! So this week Rudge finally gets the snip here in Governors Harbour ! He is 8 months old now and was overdue for neutering I was feeling. His hormones had started flowing and along with that he was just starting to roam a bit. 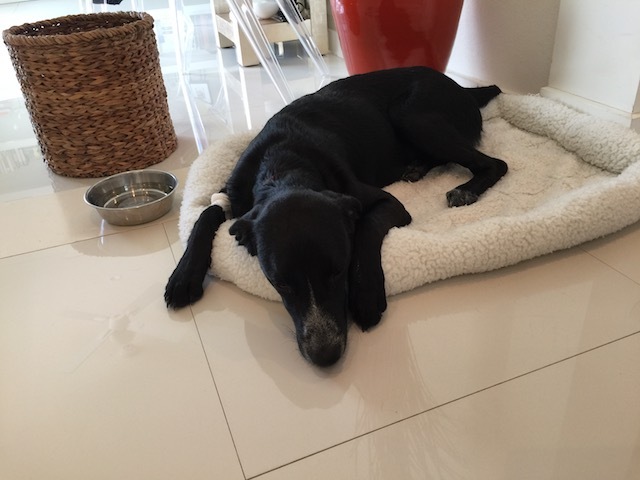 Bringing up a puppy to be a well behaved obedient dog is not easy as you dog loving owners out there know all too well – and here on the island of Eleuthera there are no dog training facilities – it is all up to the individual owner. Dear Joe Louis was the first potcake we had here and I learned more than he did from my attempts at training him. Of course all dogs have different natures and what was right for him would not necessarily be right for Rudge. On the table for surgery ! 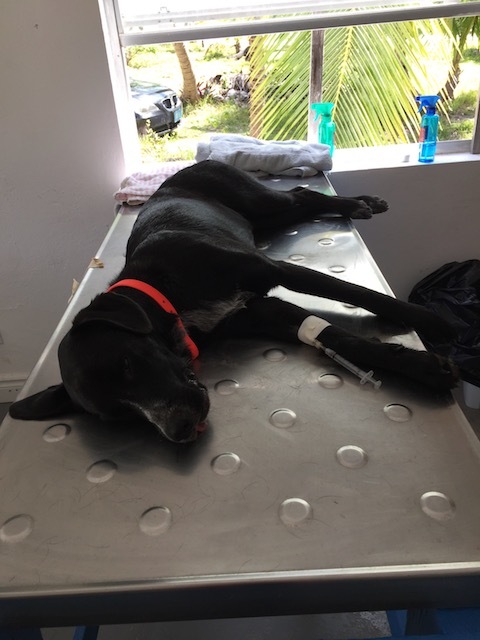 Anyway – the lovely Dr Italia Sands is still waiting for the final power hookup for her own veterinary surgery in Rock Sound – so she decided to hold a clinic at the Pineapple Fields site on Monday. Rudge followed his litter brother Rufus and they both were neutered. I picked Rudge up at 4pm and he was still experiencing the effects of the anesthetic – very unsteady on his feet and staggering around – why is it so charming and heartwarmingly funny ???? Anyway he was a good chap and didn’t chew at his stitches although there were a few puzzled glances and investigations of his anatomy for the first couple of days ! This was how he was back in September ! I have just ordered a training collar for him – I have never used one before – but he is a little too playful at times and can be intimidating to people who are not used to dogs and boisterous adolescent pups ….. He has some great runs on the beach – but of course at this age does not always ? ! come to call. 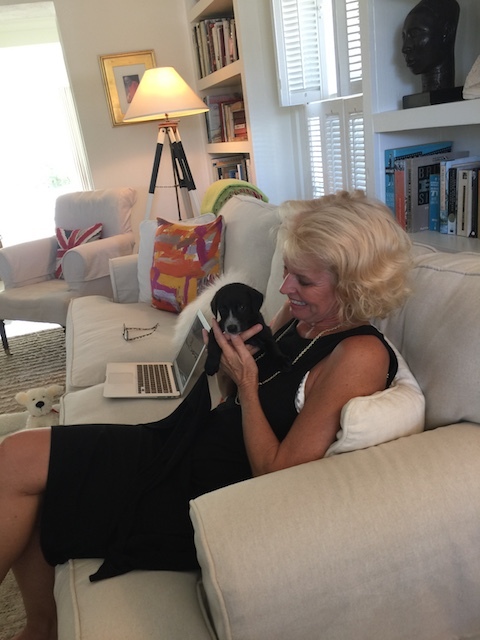 He has barked and lunged around people’s feet – feigning snapping at their ankles and I just cannot run quickly enough to get to him – and even when I can distracting him and disciplining him as it happens is not an easy task. So I have done some research and found that used properly and consistently they can be a very effective training aid. Any of you who have had experience – either good or bad – with these please share with me …. Of course it will take a week or 2 to get here but I will blog again when I have it and have been trying it out . 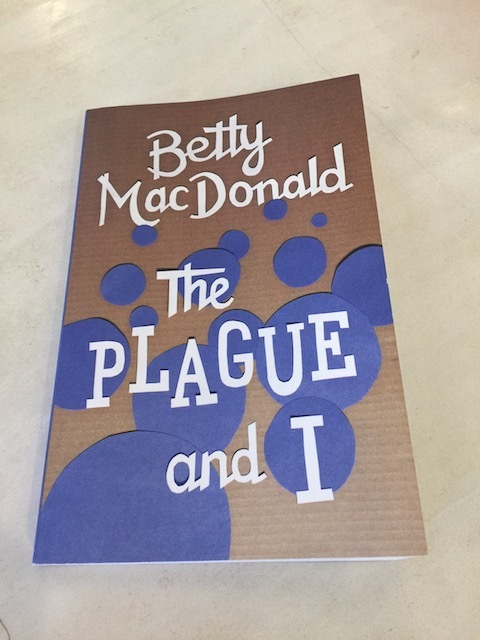 I have just finished reading a fantastic book – it is called The Plague and I by Betty MacDonald – it was published in 1948 and it is so funny ! It is about her experiences in a sanatorium while she had tuberculosis. I know – not an immediately funny sounding situation – but her observations of both patients and nurses and her hilarious wit make it a really great read. This is definitely a book I will read over again – when I get it back from various people I have recommended it to. I read about it in an on line article about funny books – various witty writers wrote about a book that they found very funny. I ordered several and this was the first one I read. I will let you know about more from the article in the future……. Very funny book – it kept on making me read bits out loud to Bob !! Bob and I are finally watching the UK series Victoria – about the young Queen Victoria – I know most of you watched it ages ago ! I love it – even though we have to watch some of the episodes twice because we fall asleep – not because it’s boring but because we are so tired !!! OK so that’s all for this week – just a reminder that the Jazz Festival is coming up at the end of the month – get your tickets if you are here – followed by the flea market on Saturday April 8th. We are holding it on the car park of the old Cigatoo Hotel at the top of the hill here in Governors Harbour – get sorting ! I do have a dog whistle but when he is in full flight down the beach I may as well be whistling Dixie as they say !!!! But thanks ! 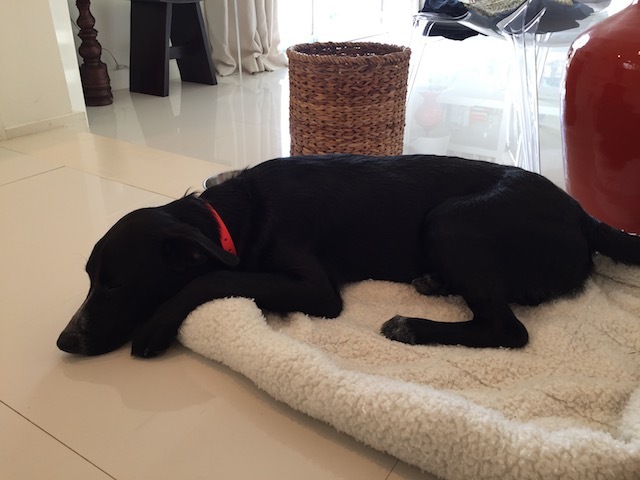 Rufus is enjoying his “staycation” in Rainbow Bay, healing well, and is missing RUDGEY! By next midweek they will be running on FR. Leave again, but as a couple of pussycats! Do they have to have their stitches out or are they dissolvable ones ? Oh Boy! A treat for good behavior for Rudge’s follow-through at your command could be a winner! We LOVE the Victoria series the first season just ended and it’s so beautifully produced and so touching. We will watch it again for sure. Interesting about MacDonald’s humorous TB book! My aunt, who was one of the first women in the OSS and a coder, came back with TB in the late forties as did many here from the “other Hamptons.” She and other family members were in sanatoriums and they all had great times!!! I bet I’d enjoy that book. I need some laughter in my life…. I can’t recommend that book enough – such clever and witty observations …… See you soon ! Try putting a few pennies in a soft drink can and shaking it to startle Rudge when he’s misbehaving. It really gets their attention even if it is for just a few seconds. Thanks for this – just tried it today ! Worked well the first time. next time he just gazed at me like I was nuts ! Third time I had to hold it above my head and shake it like a maniac – but it did work again ! I will be known as the crazy woman of GH but who cares !!! !